NASA administrator Dan Goldin told graduates of one of the nation's leading universities Friday that humans would walk on Mars within the next 20 years. In a commencement address at the Massachusetts Institute of Technology (MIT), Goldin, whose tenure as NASA administration may soon come to an end, described the unofficial but widely-accepted long-term goal of the agency's human spaceflight program. "A spacecraft will land, a hatch will open, a ladder will drop," Goldin said. "Then, the world will watch as an astronaut, in a white suit with an American flag on the shoulder, steps down and crunches her boot down on the dusty red surface of Mars." "You will make my dream come true, not in 50 years, but in the next 10 to 20," he told graduates. The statement was met with some of the loudest applause of the entire commencement ceremony. It's the second time in as many months that Goldin has mentioned the possibility of a human mission to Mars in the next 20 years. Goldin made similar statements last month at a history of human spaceflight symposium in Washington, DC. Officially, NASA has no official plans to send humans to Mars, in the next 20 years or ever. In fact, a space policy directive enacted in 1996 by then-President Clinton limits NASA human spaceflight activities and planning to Earth orbit, namely, the space shuttle and International Space Station. Research into the technology needed for human missions to Mars has been ongoing at a low level for a number of years. Ironically, though, Goldin has diverted some of the funding for such work into the space station. The future of spaceflight also includes interstellar missions and the search for extraterrestrial life, Goldin said. "You will send probes beyond our solar system and to the stars," he said. "You may look upward and answer the question as old as humankind itself: Are we alone?" Goldin told graduates that one of the high points of his time at NASA was the 1996 announcement that scientists had found evidence for past life on Mars in meteorite ALH84001. "Could you imagine being in charge of NASA and having people come into your office and say, �We think we've discovered fossilized life from Mars.' It doesn't get any better than that." That also a particularly poignant time for Goldin, since his father, a former teacher, was dying of cancer. Goldin shared the news of his discovery with his father a month before the public announcement; he passed away days after the news became public. "I can't help but believe that what kept my father alive until that announcement was made, in large part, was his lifelong commitment to learning," Goldin said. "That somehow I could play, albeit a small role, in attempting to solve one of the mysteries of life, literally gave my father more life." Goldin did not touch upon his own future in his speech, although rumors continue to fly that his time at NASA is approaching an end. A report published Friday in the Washington Times newspaper said that retired U.S. Air Force general Thomas Moorman was being considered to replace Goldin, a report based on rumors that had been spreading through NASA for weeks. Goldin has been NASA administrator since April 1992, when he was appointed by President George H. W. Bush. Goldin remained in office through President Bill Clinton's two terms in office, and was asked to stay on, at least temporarily, by President George W. Bush, son of the man who originally selected Goldin. Goldin has been in charge of NASA longer than any previous administrator in agency history. 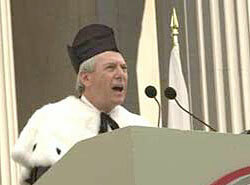 Goldin gave the address wearing not the cap and gown worn by MIT graduates or of Goldin's alma mater, New York University, but in a white, fur-lined gown and black, raised hat, the academic regalia of the University of Padua, Italy. Goldin received an honorary degree from that university, where Galileo taught four centuries ago, last year. Goldin said he wore the cap and gown to remind graduates of their distant connection to Galileo, but found a more practical purpose for it. "I wear this cap and gown because I want to give you a visual image," he said. "You may not remember me. But perhaps you will remember the cap and gown."